Alison Dalton at her solo recital this summer, accompanied by Eugenia Cheng, a math lecturer at the University of Chicago. As with all musicians in the Chicago Symphony Orchestra (CSO), violinist Alison Dalton is no stranger to high-stakes solo performances. The daughter of graduates of the Eastman School of Music, she made her debut playing Camille Saint-Saëns’ Havanaise with the Utah Symphony at only 13 years old. Decades later, on July 30 of this year, Dalton made a quieter, but no less momentous debut in the parlor of a Lincoln Park home. That evening she gave her first solo recital since a rapid decline in her eyesight forced her to take a 20-month leave from the CSO. Dalton has been a member of the CSO’s first violin section since 1987, recruited by galvanic then-Music Director Sir Georg Solti. She had perfect eyesight her entire life—that is, until less than three years ago. Without warning, Dalton’s vision began to deteriorate. The eventual diagnosis would be Bull’s Eye Maculopathy, though the term is more a description than a diagnosis. It yields no insights to the exact cause of her vision loss, which is still unknown. The term only refers to discolored rings of damaged tissue that appear on the retina, indicating some degree of vision loss. People with Bull’s Eye Maculopathy often experience “gaps” in their vision. Dalton’s “gap” is, unfortunately, right in the middle of her line of sight. “In order to read music, I actually focus on a spot above whatever it is I need to look at,” she said in a post-recital conversation. In the visually impaired community, Dalton’s technique of “looking at something without really looking at it” is called eccentric viewing. For Dalton, the tipping point was the very beginning of the 2013-2014 season. She only played one concert that season: the opening subscription concert, which included Brahms’ Symphony No. 2. That was in September 2013. Dalton was granted a generous medical leave under union contract, and she left with music director Riccardo Muti’s blessing. But she wouldn’t return to the Orchestra Hall stage for nearly two years. Life for Dalton went on, despite her leave of absence. Four of her five kids left for college and graduate school, and she got married. Musically, she stayed busy, as well, maintaining a teaching studio in Hyde Park. She even picked up Baroque violin, which requires a different instrument and technique than the modern violin, and whose repertoire is typically easier to memorize—a plus for a musician whose ability to read music was atrophying. But what Dalton remembers most from her time off from the orchestra were her countless medical appointments, hoping for a concrete diagnosis. “I must have gone to 50 doctors in that year,” she said. It was to no avail: no doctor could explain the cause of her vision loss, which still remains unclear. But Dalton wasn’t ready to give up her seat in the orchestra just yet. She made attempts to return, reading from large, Xeroxed copies of scores. But she found that she spent less rehearsal time playing and more time turning pages. During one of these frantic rehearsals, Maestro Muti’s wife, Cristina Mazzavillani Muti, noticed her fumbling with pages and struggling to keep up with the orchestra. After rehearsal, she approached Dalton. “She told me, ‘You just have to keep trying for all of us, because for the grace of God, it could have been anybody,’” Dalton recalled. Dalton took Mrs. Muti’s words to heart. But coming back to the orchestra required a completely different approach. She began exploring computerized music stands, which are capable of magnifying digitized sheet music up to many times its original size. Through trial and error, Dalton determined how her musical display would need to present the music in order to work effectively. First of all, it would need a large-display touchscreen with an editing software, so she could mark up the music during rehearsal. And as an orchestral musician, Dalton also wanted the screen itself to be discreet enough that she could play without attracting undue attention to herself. Lastly, said touchscreen would need to be able to reproduce sheet music exactly as it appeared on the page—which is where Dalton ran into trouble. “We used digitized music for a while . . . but my eyes weren’t recognizing the music. When you use manuscript parts for so long, they become part of the music itself,” Dalton said, referring to the specific sheet music used by the CSO. The caveat? Every existing technology used digitized music, which, to Dalton’s eye, looked completely foreign. Joy Bergelson of the University of Chicago’s Department of Ecology and Evolution was the one who made the breakthrough decision to use scans of printed orchestral parts. Bergelson and Dalton have been friends since 2012, when Bergelson’s daughter began taking violin lessons from Dalton. It was Bergelson who has stood by Dalton throughout the entire process, doing everything from conferring with computer scientists and music specialists to accompanying her on her countless medical appointments. In the end, Dalton and Bergelson decided to essentially start from scratch. They outfitted a 25 by 15-inch touchscreen Lenovo monitor with what Dalton calls a “suite” of publicly-available image editing softwares, allowing her to flip through the music as though it were a long PowerPoint presentation. To prepare the music, the CSO sends electronic scans of the sheet music to Dalton’s copyists. Their job is to streamline the music so it is easier to read, “rewrap” it into lines that are only three or four measures long, and enlarge the music to 400% its normal size. Then, they check the music for inaccuracies and crop it into images that show only three lines at a time—instead of sheet music’s usual 12 or so per page—allowing for a scrolling effect when pages are turned. To advance through the music, Dalton operates a foot pedal beneath the stand. In many ways, their homegrown solution is much more straightforward than the other strategies they had piloted. And, as far as Dalton is concerned, theirs is the only method that meets the technological demands of a job like hers, which requires musicians to sometimes play as many as two or three different concert programs a week. Early on, when Dalton was piloting prototypes, she rehearsed with the orchestra remotely, playing along in a backstage practice room outfitted with audiovisual feeds from the stage. This allowed her to deal with any screen-related technical difficulties without disrupting the rehearsal. But by the end of the 2014-15 season, the technology had been streamlined enough that she was able to rejoin the orchestra onstage for rehearsals, playing her first return performance in June. Over the summer, Dalton has had plenty of opportunities to put her new technology to the task, playing full-time with the CSO at the Ravinia Festival. But for her July recital, she did away with the stand entirely, playing six solo pieces from memory alongside her accompanist, Eugenia Cheng, a University of Chicago math lecturer. It was a triumphant moment for a musician who, little more than a year ago, was unsure if she’d be able to continue playing professionally at all. 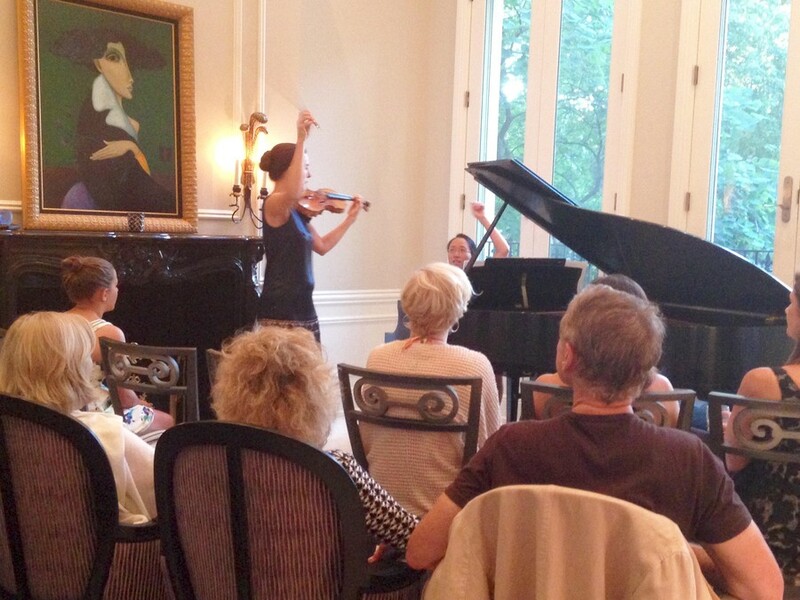 Though the occasion was a personal milestone for Dalton, the recital itself—which was hosted by her friend and onetime physician, Doctor Lauren Streicher—was casual and lighthearted. She introduced each piece to the audience, cracked jokes, and took questions throughout. Included on the program was William Kroll’s hog-stomping novelty Banjo and Fiddle, and, in the vein of her preteen debut, another sparkling showpiece by Saint-Saëns, the Introduction et Rondo Capriccioso. At the conclusion of the virtuosic Vitali Chaconne—an evening centerpiece—she and Cheng high-fived, their faces plastered with huge grins. But for someone whose entire life has been intertwined with music, giving up is simply not an option. This fall marks Dalton’s return to the Orchestra Hall stage, and the 2015-2016 season will be her first full season with the symphony since her leave of absence. She will continue playing in the symphony so long as she can play confidently and accurately—a period that has been prolonged thanks to her digital display. Dalton couldn’t be happier. When asked what fuels her perseverance, she recounted one of her backstage rehearsals with the CSO earlier this year. The orchestra had been preparing an all-Baroque concert, and she listened as Bach’s Orchestral Suite No. 3 was piped through the sound system. Suddenly, she was overwhelmed by the music all over again.